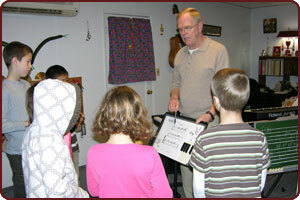 Robert Bolton has taught music and keyboard fundamentals to children ages three to eighteen for over twenty five years. The Vancouver Harmony Road Music School was established in 1988, has taught thousands of students ear training, music theory, sight reading, and improvisation skills. Yamaha International Education Division, Buena Park, CA. Studied methods of teaching ear training, sight reading, rhythm development, ensemble playing, music appreciation, and performance for children beginning ages three to eleven. As a certified music teacher, Robert received continual education in yearly seminars conducted by international, American, and Japanese master teachers. Studied music education, choral conducting and performance in piano, trumpet, and voice. Obtained Bachelor Degree. Studied music theory, history, composition and performance on trumpet and piano. Sister Ann Cecile Diagle, Marylhurst College. Gene Confer – Jazz, Portland, OR. Richard Thornberg, Portland Symphony Artist. James Smith, Portland Symphony Artist. Twenty five years of teaching music and keyboard fundamentals to children beginning ages three to eleven utilizing the Yamaha Education System principles. The system develops music in students through singing, ear training, theory, sight reading, improvisation, ensemble playing and performance while developing keyboard skills. The method requires singing while playing the piano or guitar. Recertified as a Harmony Road Music Instructor in 1999. Music Director at Saint Rita Parish. Selects music, teaches new music to the choir and congregation, provides piano-keyboard accompaniment, cantors, works with the Choir, and enjoys a congregation that loves to sing. Currently enrolled in the Lay Ministry Studies Program. [2000 – 2003] Holy Redeemer Catholic Church, Vancouver, WA. Music Director and principal keyboard accompanist. Selected music, taught new music to the congregation, sang solos and cantored. Introduced praise singing to the worship service. [1996 – 2000] First United Methodist Church, Vancouver, WA. Developed and integrated praise singing into the worship service. Provided piano accompaniment to congregational singing as well as solo performance on piano, trumpet, voice, and guitar. Developed and performed a “History of Music” Concert for Cascade Piano in Portland, introducing the use of synthesizers to Christian Churches in the Portland Metropolitan area. Robert Bolton is happily married with four children, three stepchildren, five grandchildren and two step grandchildren. ♪File is in PDF format. I was very impressed with the method in which Mr. Bolton conducted his classes and how he held the attention and interest of his very young students the entire time. Every few minutes the students moved from their key boards to the center of the room for participation in verbal and chalk-board information about music notes and scales, and for hands on experience with a number of percussion instruments, e.g., tambourines, triangles, etc. As a grandmother, I felt it was good for children to have a foundation in music and piano. I appreciated how he made music come alive. He made music fun and was good at encouraging each student.